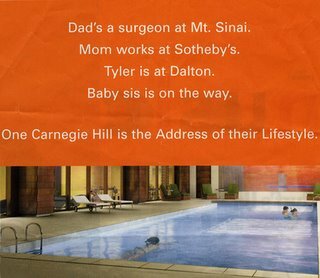 Copyranter (hey, we knew there were more ranters out there) points to a real estate ad in the New York Times Magazine for One Carnegie Hall that clearly states who is and who is not welcome to live at this address. The copy reads, "Dad's a surgeon at Mt. Sinai. Mom works at Sotheby's. Tyler is at Dalton. Baby sis is on the way." While that paints an airy picture of New York's upper crust, Copyranter translates the ad into reality here.